CHENNAI: A defence laboratory in Chennai may have the right recipe for the Centre’s quest for technological solutions to seal the international border with Pakistan in two years. Scientists at the Combat Vehicle Research and Development Establishment (CVRDE) at Avadi here have developed an unmanned surveillance ground vehicle that can zero-in on 99 moving objects simultaneously from a distance of 10 to 16 km and transmit information. 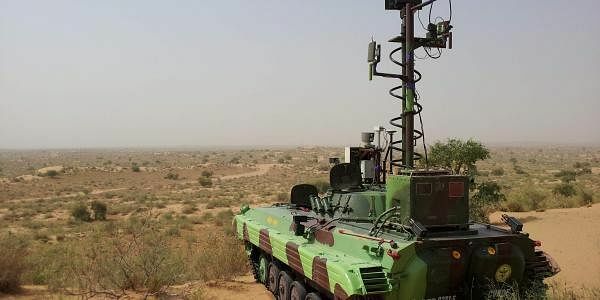 Officials claimed the vehicle codenamed MUNTRA-S (Tracked Unmanned Group Vehicle for Surveillance) is the first unmanned vehicle from the DRDO stable conforming to military standards for both hardware and software designs. A range of technologies and systems are incorporated including electro-optics, sensor fusion, electro-mechanical actuators and communication systems, which enable it to detect targets from a crawling man to heavy vehicles. An official source told Express that MUNTRA-S had been developed on the amphibious BMP-II tracked armoured vehicle, which enabled it to be deployed for unmanned surveillance missions in all types of battle environment, day and night. This comes at a time when the Centre is increasingly looking at advanced technologies like sensors, cameras, drones and radars to patrol and protect the borders. India shares a 3,323 km long land border and 740 km marine border with Pakistan, both equally under threat from infiltrators. Of these, there are 181.85 km where physical barriers cannot be built due to geographic constraints like riverine, low-lying lands, creek and marsh. Sources said the vehicle is ready, noting that a technology demonstration was conducted on board a defence vessel near the Chennai coast last year. It was witnessed by top officials of the South Sector of Central Industrial Security Force and the Border Security Force. type of terrain. If the view is clear like in the sea, the sensors can pin down on an unauthorised object from a distance of 16 km, ” sources said. MUNTRA consists of two vehicles, both on the BMP II class of tracked vehicles. MUNTRA-B is the base vehicle from which MUNTRA-S is controlled. MUNTRA-S is the surveillance UGV and can be teleoperated from MUNTRA-B within a radius of 20 km.